Hello dear friends, followers and visitors. I am one of her zillion designers, lol. BUT, the more the merrier, right? 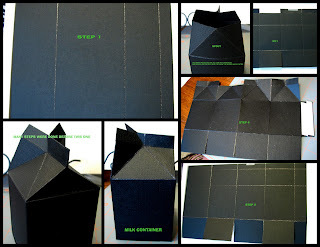 where you will find the instructions and pictures for the Milk carton and much more. I also made a robot of course, because ROBOTZ is the cart of the month at Pammy's. I will still show a collage of some of the steps it took me to make it and I know after you see it you won't be mad at me, and you will be happy I did not try to explain all these measurements, lol. 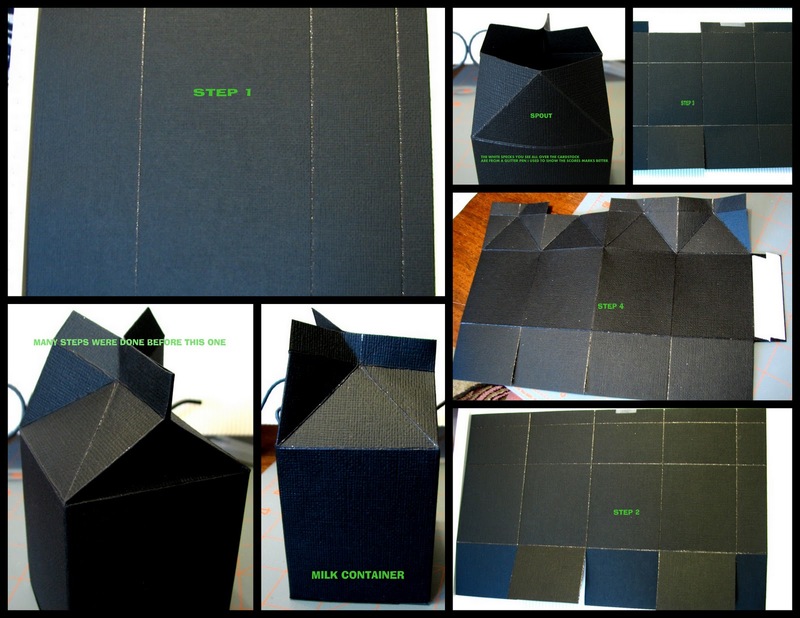 This is the finished project in case you do not want to bother with the instructions. 2.30 inch wide x 2.75 inch high. I had to play with my Gypsy to get him skinnier to fit in this 2.5 x 3" rectangle panel. This is another panel where I used one of my G-Studio clear stamps and added a ribbon this ribbon has embroidered on some little spiders. 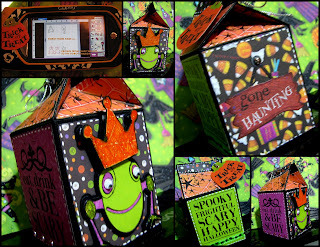 The Trick or Treat tag is from a K&CO Halloween die cuts pack and I attached it with an eyelet and some silvery twine. I want to point out that I cut every single rectangle with my Fiskars trimmer and each rectangle was inked, and faux stitched. The orange paper was also stamped with with another set of G-Studios (stars) clear stamps and the white lines from the spider web in the background were glittered with a glitter pen. The "gone Haunting" sign is also from the same K&CO Halloween die cuts. I went over all the candy corn and used the glitter pen on them. I also outlined the words and the frame with the same pen. I love that pen, can you tell? lol. Now, I will show you the collage I was talking about in the beginning, where I show some of the steps I followed in the manufacturing of this beauty. The robot was popped up and so was the crown, I also used stickles on the feet, elbows and crown. Some googly eyes were added to the face. Here is my Gypsy where I tweaked my robot and welded the crown to the shadows. I hope you enjoy this project as much as I did making it. It is beautiful-beautiful-beautiful in real life. You have to try this project some time. I will put some goodies inside and give it to my son for Halloween. The paper used was a gift from my friend Valerie from http://www.craftygolucky.blogspot.com/. She sent me a K&CO Halloween stack called "Halloween" from Tim Coffey. Thanks to Pam again for giving the opportunity to showcase my work in her blog. It is my pleasure and honor to be a Gyptian designer. Oh, my! That is such a cute milk carton! You have really done a fantastic job on this! I love all the detail! and that robot frog! How cute! so in keeping with the 21st century - A scary Halloween Robot!!! :)You made my day. I totally love this!!! Thanks for the instructions!! What a cute container for your son! I bet he'll love it.